Trigger Warning: If you are so fragile as to be easily hurt or offended, this article is not for you. Here’s an IQ test for you. 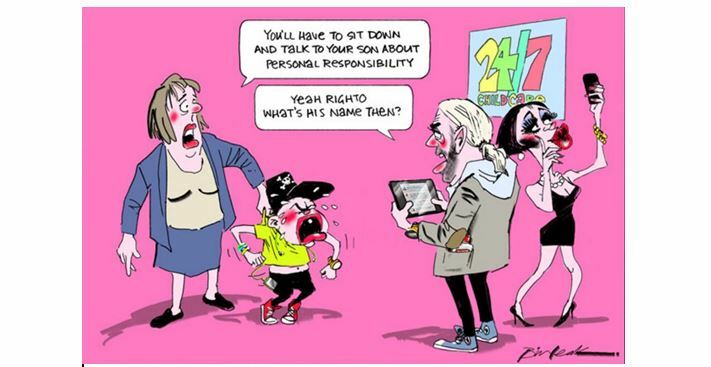 Look at the Bill Leak cartoon below. The context is the role police officer Chris Hurley played in the death of Aboriginal man Cameron Doomadgee on Palm Island. I’m providing the context because, without it, Leak’s cartoon are subject to gross misinterpretation, drawn in response to news events of the day. Incidentally, just briefly, because of the poor handling of that case, my father, Colin Dillon, Australia’s first Aboriginal police officer (among many other accomplishments), resigned in protest from his position as a senior advisor on Indigenous Affairs with the Queensland government. But more about my father shortly. 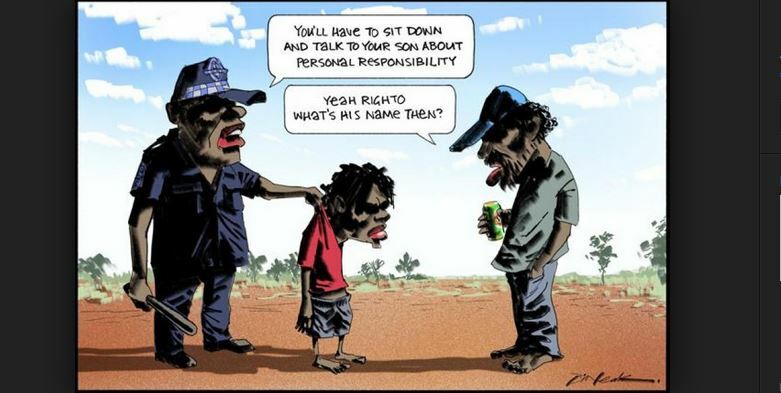 Do you think Bill was suggesting in that cartoon that all white policemen are a danger to Aboriginal people? Was he generalising or stereotyping (the official term favoured by victim brigade)? Of course not. Now consider what happened in response to his cartoon of August 4 last year, reproduced below. The chronically offended accused Bill of stereotyping and racism, even though there were no such complaints about the previous one. Do stereotyping and racism only run one way? Those who only see a stereotype in the second cartoon, but not the first,score highly for a different type of IQ, their Inconsistency Quotient. So why the shouts of “He’s stereotyping!” for that second cartoon? Why the inconsistency? Simply, because this one painted an inconvenient truth. This cartoon mirrors the second one — note that the caption is identical — and those of us who recall recent history will grasp at a glance that Bill drew it in response to the criticism he copped for the previous one. Do you think he was suggesting that all white parents are neglectful of their children? Was he suggesting that all white kids are brats? Nobody accused Bill of generalising or stereotyping this time. But there are inconsistencies, even with the criticisms about that 4 August cartoon. Why didn’t we hear, “He’s stereotyping employed Aboriginal men as policemen!”? Contacted Bill and told him it was a brilliant cartoon and that he has my unequivocal support and backing in all that he does in producing cartoons that are merely trying to depict and illustrate to those in ivory castles, as well as the moron brigade, what the real state of things is in the Indigenous world, the things that they choose to ignore and sweep under the carpet. I also told him to stay strong, not be deterred in any way from delivering his messages in the best way he knows how, through his incredible and artistic skills as a brilliant cartoonist. I advised him he could use my name anytime and wherever he felt it appropriate to let his detractors know that I fully support him in all he does. A good percentage of my workmates are Aboriginal. They’re the ones that are waiting for me to arrive in Darwin between 5 and 6am so they can start their day. Bill was never talking about them. He was talking about the kids I see every single week wandering the streets of Katherine at 2.30 on a Tuesday morning. I see kids as young as 8 walking alone at that time, just kicking a ball around. Their lives are over before they’ve even started. It breaks my heart. And for the record not one of my workmates were bothered by his cartoon. They feel that having “change the date” tantrums and calling everyone racist is enough to fix the real problems facing Aboriginal people. No one is winning. I would love nothing more than to charter a 747 and take these inner city lefties to the places I go, at the times I’m there. They can hand out Invasion Day flyers and see if it helps these poor people. There were many attacks on Bill and his alleged racism, both at the time of August 4 cartoon’s publication, and more recently after the unfortunate passing of my great mate. I have written about the pathetic attacks previously here in Quadrant and in The Australian. More recently, Chris Mitchell provided an excellent defence of Leak’s cartoon and his character. Of course McQuire does not provide the context which inspired Bill — the Four Corners faux expose of an innocent Aboriginal boy being brutalised in a child-detention centre that would help her New Matilda readers better understand the cartoons — allowing, of course, that the sort of people who read and write for that website are either capable or willing to engage in rational thought and analysis. But even without the context crucial for understanding the drawings of a newspaper cartoonist, anyone interested in Aboriginal affairs knows of the shockingly high rates of violence and child abuse. Bill was not just pulling these images out of thin air. You might coil back (sic) from Ms Rule’s comments, but remember that Aboriginal people had the very same reaction to his cartoons. While the media wants to paint Leak as a freedom of speech warrior, his work ironically contributed to the silencing of a people who are rarely afforded his large media platform. If people do “coil back” from Ms Rule’s comments, it is likely because they have the honesty and intelligence (not much of the latter is needed, by the way) to recognise the depiction of Leak as a racist as a total and absolute nonsense. The idea that he had a hand in the silencing of anyone is an even greater absurdity. My hope is that I don’t need to write another piece about the slanders heaped on my mate Bill. I loved him like a big brother and miss him every day, when I still feel like giving him a call but know his phone will never again be answered. No, grief isn’t the reason, it’s because Bill was nailed to the cross of 18C to be tormented by his critics and the creatures who have the Human Rights Commission a taxpayer-funded cudgel to beat down anyone they — take that to mean the Left — does not like and needs to silence. Section 18C is an obscenity. Unlike Bill, it needs to die, the sooner the better. Thank you Anthony. A great contribution to the legacy of Bill Leak. I didn’t know him personally but there is not a day gone by since his death where I’m not thinking of him. “Trigger Warning” is still on my desk and helps me every time I need a positive lift. I think that the left hated him because he got it right so many times. It irked them that it wasn’t them who made truly meaningful contribution to Indigenous affairs and other subjects. Guido even though you did not know him personally, you would have felt like you knew him because he was that kind of guy. Another excellent, tell-it-as-it-is, hard hitting article from Anthony. Congratulations to him yet again. Well said, yet again, Anthony Dillon. Amy McQuire calls herself a journalist but she has not got the faintest idea of what a journalist is, even in these days of low standards. She is published on New Matilda, a propaganda site which clearly employs no sub-editors and where the editor allows his favourites to say whatever they want. McQuire is a propaganda hack, and sadly, there are a lot of them around. Anthony, you put into words what so many of us are thinking and feeling. I’d hoped that one cay I would have the privilege of meeting Bill, but sometimes ‘one day’ doesn’t come. But I hope I can keep him in my heart as an example of how to live and stand up for the most oppressed in our society. I’ll let the pseudo-‘Left’ stand up for the status quo and for the elites. Thank you. I met Bill briefly last year at an IPA function where Brendan O’Neill was speaking (in Sydney). My husband and I made our way to Bill before the proceedings started and I congratulated him on his brilliant cartoon with the soldier on the plinth defending free speech. Bill was warm and enthusiastic and had a huge smile. I’m glad we went to the trouble. When I returned home I had to attend a lecture the next day. A friend at our music group asked what the lecture was and when I said it was the IPA and I’d met Bill Leak he turned vicious and said, “that disgusting human being…”. I was shocked and said I admired him and when the subject of Bill came up with another friend a week ago that same man had the good grace not to buy into the conversation. Brilliantly put, encapsulates everything about the sheer absurdity of 18c and the appalling injustice done to a very decent talented man. My old granny used to say ” empty vessels make the mist sound”. And how right she was. These disgusting people who purport to speak for Australians, aboriginal pr not, need a good swift kick up the bum.They have helped to turn our country into a disrespectful, perpetually offended and intolerant place where the values of free speech and fair play have been lost to the barbarians. Anthony, I too miss Bill Leak. Not that I knew him but the first thing I did every day was to look for his cartoon in The Australian to see who was copping it. So every day I am reminded of his passing.But you know, karma has a way of coming back to bite you and I hope all those nasty, vicious and ignorant people get it in spades!